Like with many other appliances in your kitchen, you might not notice something is wrong with your garbage disposal until it has suddenly stopped working. Like with many other appliances in your kitchen, you might not notice something is wrong with your garbage disposal until it has suddenly stopped working. When you live in an apartment or a rented house, dealing with this is simple – all you have to do is call maintenance or put in an online request, and someone should be along within a day or two to sort it out. But if you live in a single-family home, you’ll have to deal with it yourself. That’s when it’s time to call Master Plumbing! The first time you become aware that your garbage disposal doesn’t work is that it won’t start when you flip the associated switch. If this is the case, then something has gone wrong with the power supply. Is it unplugged? Plug it back in and give it a minute to reset. After you do this, test it, and if it’s back to normal, you can blame a bad circuit. The second sign is normal noise from your garbage disposal, but you see that nothing is happening. Something is clogging it or preventing it from working correctly. Pouring things down the sink that don’t belong is never a good idea, but in this situation, it could damage your disposal unit. The problem could be that the flywheel is stuck – but don’t use your hand to unstick it! How often do you run your garbage disposal? Like anything else that runs on electricity, it could have simply overheated and switched off to avoid further problems. Find the reset button underneath the disposal and press it to see if that makes any difference. Leaks are also a frequent occurrence. When you find a leak, don’t run the disposal. Instead, turn it off and cut the power for the time being. Re-tighten the bolts to stop any leaks, although you might need plumber’s putty to help seal any larger cracks. This is the worst-case scenario. 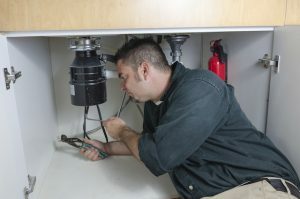 In case your garbage disposal has suffered total failure, it’s time for a new one entirely. See if you are still under warranty before you start doing your research to find the best price. This entry was posted on Friday, May 25th, 2018 at 8:32 pm. Both comments and pings are currently closed.